Parc Aviation scooped the best agency of the year award for large agency whilst Recruitment Plus scored Best Small Agency for the 2nd year in row, at the 5th annual recruitment awards which took place on Friday evening, (25th November 2011) at a gala awards ceremonyin The Shelbourne Hotel, Dublin. This was the biggest event ever held by the NRF with more than 320 attendees at the Ceremony which was presented by RTE’s Pamela Flood. Robert Walters clinched the award for Best Agency Online Service for the second year running whilst Careers Register won the Accountancy and Finance category for ‘Best in Practice’. Parc Aviation and Recruitment Plus were hailed by the judges as ‘leaders in their industry’. The judges found them to ‘have clear roadmaps of where they want to be, their commitment to the customer came across very strongly and they are completely in touch in what is required of them. Staff retention is testament to what they have achieved and in both cases professionalism has shone through’. 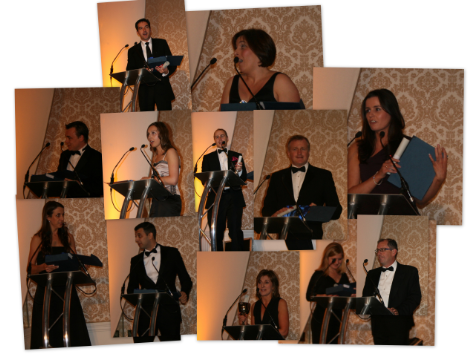 Parc Aviation got off to a winning start from the beginning of the night. First up to the winning podium for Parc Aviation was Nikki King who was awarded one of the coveted Graduate of the year awards. Also receiving recognition in the ‘Best in Practice’ category they won Best in Practice Technical, Engineering & Science and the Best Practice in “Specialism” Awards. Sigmar’s Peter Nunan was awarded Recruitment Consultant of the year narrowly beating off stiff competition from the other 6 shortlisted nominees who were,Grafton Recruitment’s Kevin Clarke, Lisa Collins from Hays, Sandra Mc Guirk from Parc, Lisa Russell from Servisource, Louise Delany from Quest Recruitment and Karen Kavanagh from Noel Recruitment. Sigmar were also awarded Best in Practice Sales & Marketing for the 2nd year running whilst Shaun O’ Shea was another winner of the Graduate of the Year award. Servisource took the Best in Practice “Healthcare” and O’Reilly Recruitment took the Best in Practice “Light Industrial”. CPL was awarded Best in Practice “IT & Telecoms” and Misty Plotner received a winner award for Graduate of the year. Osborne Recruitment took the Best in Practice “Office & Secretarial” and Joanne Murray received a graduate of the year winners’ award. Noel Recruitment took the Best in practice Hotel & Catering for the 4th year running and Karen Kavanagh took a winner award for Graduate of the year. Designed to identify and reward excellence in recruitment in Ireland, the initiative was open to all NRF members and judged by an independent panel. · NRF Cert RP Graduates of the year – Karen Kavanagh Noel Recruitment, Nikki King Parc Aviation, Joanne Murray Osborne Recruitment, Misty Plotner CPL and Shaun O’Shea Sigmar Recruitment. The panel of judges were; Tony Lambert – CEO, Fingal Chamber of Commerce, Patrick Meehan, Invictus Management, Gillian Econopouly, Recruitment Employment Confederation UK, and the online award was judged by Sorcha Corcoran of Silicon Republic. Chairperson of the Judging Panel, Tony Lambert told the delegates how challenging it was for the adjudicators to elect a winner in a lot of categories. Not only had the volume of entries increased on every other year since the awards began but the sheer quality and outstanding excellence was evident in all applications. To be on the shortlists this year was in itself an achievement. The NRF also awarded Mary B Cremin with an Honorary Fellowship Award. Director of NRF Geraldine King gave the delegates a little bit of history of how Mary came to be one of the most respected names in the Industry. Even though she is now retired her reputation and her passion for excellence will always be remembered. The National Recruitment Federation is a voluntary organisation set up to establish and maintain standards and codes of practice for the recruitment industry. Representing member companies throughout Ireland the NRF focuses its attentions on providing these members who have opted for self-regulation with the best possible service in terms of communication, support, advice sharing and problem solving. 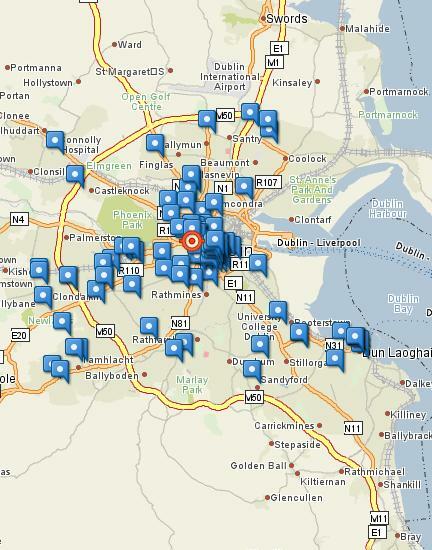 Where are the Recruitment Agencies in Dublin? I know one thing I did a training and consultancy in the recruitment agencies this year From Swords to Bray, and even further in Graystones. None of those recruitment agencies are on the map. Perhaps those are other counties? Bray and further south is Wicklow, and perhaps those are only the Dublin based displayed? A nice touch from the Golden pages, I think. Is it worth their subscription fee, that is another question. 96 recruitment agencies opted for this advertisement. I wonder if it brought any business? Posted on December 9, 2008 December 9, 2008 Categories Jobs, Recruitment, Recruitment AgencyTags AA Appointments (Ireland) Ltd, Accountancy Connections, Accountants Register, Accreate, Achievers Group The, Action Recruitment, Adecco Recruitment, Agency Group, Ajilon, All Care Recruitment, Atlanco Ltd, Atlas Personnel Group, Bond Personnel Group Ltd, Brightwater Selection (Irl) Ltd, Canal Local Employment Service, Canal Local Employment Service Job Club, CCI Recruitment, Centre Point Group, Circle Recruitment Consultants Ltd, Cliffe Financial Recruitment, CMI Recruitment, Computer People, Computer Placement Ltd, Coms Recruitment, Cowhig Kate International Recruitment, CSR, Drivers Employment Agency, Elan It Resource, Employment Network (Ten) The, European Business Bureau Ltd, FÁS, Fast Financial Recruitment Ltd, Finglas Cabra Partnership, Firstaff Personnel Consultants Ltd, Food Industry Recruitment, Gallen Toni Recruitment Ltd, Grafton Recruitment, Griffin Personnel Consultants, Hall Recruitment, Hays Montrose, HRM, Hynes Agency, ICDS, ICDS Constructors Ltd, ICDS Group, Irish Recruitment Consultants Ltd, Kelly Services, KWCD Local Employment Service, Maria Logan Recruitment, McEvoy Recruitment & Training Ltd, McGrath Saunders Limited, Meghen Group, Micheal Page International, Millennium People Recruitment, Monster.ie Recruitment Ire. Ltd, MSS, Nanny Solutions, Nanny Solutions Ltd, New Move Recruitment Services Irl Ltd, Nixers Ltd, North West Inner City Local Employment Service, Northside Recruitment Services, NRS Refurbishment, Nurse On Call, O'Loughlin Partnership, Osborne Recruitment, People Group The, Premier Group, Principle HR, Progressive Placements Ltd, Public Appointments Service, Quest Recruitment, Reach Recruitment Consultants Ltd, Recruitment Plus, REED Personnel Services, Reynolds Recruitment, RFC Recruitment Group, Robert Walters, Rochford Files Ltd, Sales Appointments Ltd, Sales Placement Ltd, Science Recruitment Ireland, Science Recruitment Ireland Ltd, Selective Recruitment, Sigmar Recruitment Consultants Limited, Sigmar Recruitment Ltd, The Firm Catering Recruitment, Trent ESM Ltd, Venn GroupLeave a comment on Where are the Recruitment Agencies in Dublin?